The golden age of Trans Am lives on. The excitement of the series from 1966 until 1972 truly lit a fire under many muscle and Pony car enthusiasts. Today, vintage Trans Am cars are among the most popular at historic racing events. 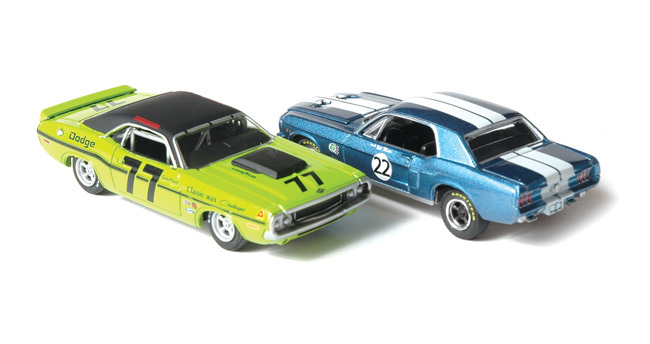 GreenLight continues to bring these cars to scale with its latest Road Racers Diorama set. This pairing features the 1968 Mustang GT driven by Bill Maier and the 1970 entry from San Posey. The #22 Mustang Coupe is finished in blue and white and features blacked-out American Racing wheels on Goodyear tires. The factory interior has been used, but the 289cid racing engine is covered in silver. The Posey #77 Dodge Challenger is the trendy Sublime Lime with simulated black vinyl top. The Challenger has a fully caged interior and a black small-block Mopar V-8 under the scoop-enhanced hood. Ironically, Maier and Posey, although competitive, each had little success during the years of these cars. Two icons, Mark Donohue and Parnelli Jones, dominated the ’68 and ’70 seasons. The popular cars live on, however, thanks to GreenLight.